Biographical sketches are certainly not my forte. A person’s life, especially the life of someone as dedicated to a significant cause such as Ward, is difficult, if not impossible, to summarize in a few pages of text. I think that it is safe to say that once Ward came under the spell of Red Rock Country, he did everything in his power to increase public awareness and appreciation of this extraordinary land. His contribution cannot merely be measured by the number of books he published or by the amount of environmental legislation he helped to change. Rather, the true contribution must be looked at in terms of the number of people that Ward and his wife Gloria inspired to set out on their own quest in service to the Land. That number, while immeasurable, is immense. I can't help shivering as the brisk air swirls around my body on this very cold November afternoon. I zip up my jacket and quickly tuck my hands into my pockets along with a small bag full of red soil from Red Rock Country. Before me lies the casket of my friend and mentor, Ward Roylance. I look up at the cloudless blue sky which serves as a spectacular backdrop for the snow capped peaks of Wasatch Mountains. Imposing in size and rugged in appearance, it seems impossible not to be awed by the panoramic vista before me. Suspended high in the eastern sky is a quarter moon appearing to gaze down upon the events of the afternoon. As I stare at the moon I reflect back six months as I stood next to Ward near the Temple of the Moon during a trip into Cathedral Valley. What a splendid trip that was! We spent two days bouncing around the red sand of the valley floor in Ward's truck, gazing upward at the towering monolithic formations in absolute awe at the magnitude of the beauty surrounding us. On that trip Ward heightened my esthetic awareness to an extraordinary degree. I had been on several other trips with Ward and he had taught me a great deal, but in Cathedral Valley I was finally able to truly see. Artistic revelation after revelation pounded my supersaturated senses until I experienced almost spiritual vision of the esthetic perfection of form and design which surrounded us. Much of the art had been there for thousands, even millions, of years. Timeless sentinels, waiting. But waiting for what? Many a human eye had gazed upon these extraordinary formations and no doubt been impressed by their shear size and form. But how many have seen beyond the rock? How many have seen the traces of divine artistry which lie within the rock? No doubt very few. Few are prepared to have their eyes and souls totally opened. Few are capable of handling the torrent of emotion that accompanies such a revelation. Ward was prepared. He saw what most others could not. But most marvelous of all, Ward could help others to see. In many respects Ward was a lens through which others could sharpen their own focus. He's done it for me and he's done it for others. Anyone who has been touched by Red Rock Country should consider themselves blessed if they had the opportunity to meet Ward. The following morning Ward and I witnessed a dawn of such unbelievable beauty that much of it was simply beyond the human capacity to absorb. To this day, I struggle with words to adequately express the magnitude of that experience. I think that in our own way, we each had a glimpse of Heaven on that very special morning. A cold breeze once again encircles my body and tears my thoughts back to the present. As a symbolic gesture of his unity with Red Rock Country, I pour the bag of red sand over Ward’s casket. Several of Ward’s family members and friends do the same. It is hard to not think of a funeral as an end because certainly, in some respects, it is an end. Many things will never be the same. However, for a funeral to represent an absolute end is a tragedy. I find much satisfaction in the fact that Ward's funeral does not fall into this category. Ward has left a legacy for those who continue to walk in his Enchanted Wilderness. Because of the seeds he has sown, his spirit will live on forever. Born in 1920, Ward spent most of his childhood in northern Utah. It wasn’t until he was 21 years old that he managed to take his first trip into Red Rock Country, just a few weeks prior to his voluntary induction into the army. Sparked by what he had read about southern Utah in a copy of Utah: A Guide to the State and some Zane Grey novels, Ward loaded up his 1932 convertible roadster and headed down to Dead Horse Point. In a scenario that is very familiar to anyone who has been touched by the Land, Ward’s life was changed forever. He was awestruck by what he experienced, both visually and aurally - the silence was mind boggling. In almost a heartbeat, southern Utah was in his blood. During the following four years of military service, Ward’s travels took him to France, Germany, and Austria. World travel made Ward realize, more than ever, that his heart lay in Utah. He also traveled quite a bit after the war, and he always used his travels to compare Utah, geographically and culturally, with other areas of the world. It made him realize how extraordinarily unique the Red Rock Country of southern Utah really was. There is simply no other place on earth like it. Glen Canyon in its primeval beauty was a natural wonder of the world, a continual Zion Canyon in miniature, 190 miles of glorious red cliffs ornamented with an endlessly varied assortment of rock forms, relief designs, and color tapestries. There were miles of sandy beaches and dense willow forests. Dozens of sheer-walled side canyons and narrow slots in the cliffs invited exploration; some of them contained prehistoric ruins and rock art. There were beaver, deer, birds and other wild creatures. 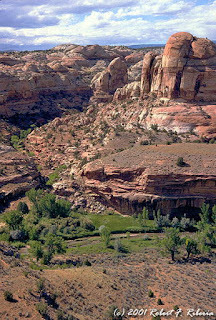 There were old log cabins, the Stanton dredge, Hole-in-the-Rock, Halls Crossing, and Old Ute Ford where the Dominguez-Escalante expedition crossed the river in 1776. Those sites are all buried now by water and muck. Ward’s thirst for knowledge relating to Utah and the Colorado Plateau was insatiable. He began collecting Utah books, a collection that at its peak amounted to nearly 600 titles. More important than the books themselves, Ward was acquiring an enormous amount of knowledge relating to Utah, knowledge that would prove vital for his global vision of the preservation of Red Rock Country as a region. In 1949 Ward took a tour of duty with the Foreign Service in Vietnam. After returning in 1951, he completed his studies at the University of Utah, graduating in 1952 with a degree in elementary education. Although his career as a teacher was short, his entrepreneurial spirit was intense and he soon began authoring numerous publications relating to Utah. In 1957 Ward received his Masters degree after writing a thesis relating to Utah. Later that year Ward began one of the most influential periods of his life, his eight years of employment with the Utah Travel Council. During this period Ward authored hundreds of publications relating to Utah, with millions of copies being distributed. During this period Ward traveled all over Utah, by whatever means possible, to research his publications. It was not merely a job, it was a labor of love. Ward left the Utah Travel Council in 1965 and struck out on his own producing, among other things, educational films about Utah geography. When Gloria became my companion, I became We. No longer was I lonely. I had no more deep depressions. Her vibrancy, happiness, and sheer joie-de-vivre have always buoyed sagging spirits before they could plunge to previous depths. Even now, 20 years later, I cannot believe such love, support and acceptance. Gloria sees the beauties I see, and we share in common not only the physical things of our lives but most of the intangible as well. Such a relationship of perfect compatibility is more than I ever hoped was possible. In 1969 Ward and Gloria, along with a group of geology professors, formed the Enchanted Wilderness Association. This organization was formed to lead guided tours into canyon country and to promote appreciation and understanding of the Colorado Plateau area. Ward and Gloria even designed a beautiful full-color magazine to promote their organization. Despite enormous financial difficulties, the organization survived for three years and attracted over 1000 members. However, financial distress ultimately resulted in the end of the organization three years after it was formed. This maiden issue of The Enchanted Wilderness Magazine is designed as an introduction to a New World. Not a New World in obvious ways, of course, for this is a very old, very ancient world that reveals the pages of geological time in an almost unbroken sequence for more than a billion years. The "feel" of relative eternity is a pervading, even oppressive atmosphere in the Enchanted Wilderness. Evidences of life all the way up from its primeval beginnings have been found here. And numerous cultures have left their marks throughout this land, some in rich abundance. Still, as an original concept of "Enchanted Wilderness" this is a new world. 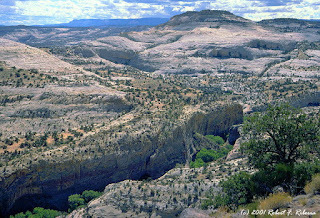 Until now the Colorado Plateau as a unit...as an integral whole...as a distinct physiographic province...has not been recognized by more than a handful of visionary people as a world resource, a unique wilderness of true enchantment. Heretofore, "wilderness" to most people has meant the remote fastnesses of lofty mountain ranges, or unviolated pockets of wild lands scattered here and there. But how many have been aware that the Colorado Plateau is the largest wild or near-wild province still remaining in the 48 contiguous states - a vast and, until recently, little known region larger than the State of New Mexico and containing fewer than a half million inhabitants? Who has had the vision to evaluate this natural World Shrine at its actual and potential worth - not as a shattered entity broken up into political subdivisions, exploited haphazardly and ruthlessly for its removable and manipulative resources, but rather as an integral, homogeneous wilderness having similar but extraordinary physical characteristics over much of its great extent? 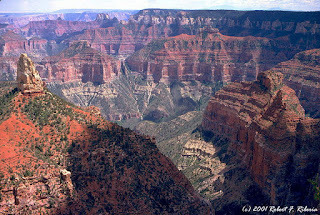 Who has had the vision (even a faint glimmer) to recognize the incalculable future worth of the Colorado Plateau as a region - not as bits and pieces of isolated parks...not as a golden opportunity for indiscriminate industrial exploitation and expanding urbanization...not as a newly-discovered playground for uncontrolled travel and recreation...but as a precious wilderness, valuable to the world for its peace and loneliness as well as its minerals, for its inspiring beauty and strange enchantment as well as its boundless opportunities for physical recreation? A few people have had this exciting vision. It is our dream to increase their numbers. 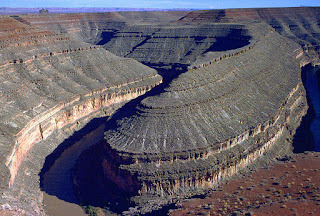 EWA's stated goal is "the preservation of the unique attributes of the Colorado Plateau and its Borderlands - the Enchanted Wilderness - through enlightened public awareness and controlled utilization of its priceless resources. Ward suffered from a painful congenital hip problem, which often limited his physical activity. In 1974, Ward had both hip joints replaced. Feeling like a new man, he began construction of a home in Torrey in 1976, on a lot that Ward and Gloria had purchased seven years prior. Ward wanted to avoid the "monotonous uniformity in walls and surfaces" of conventional design. The resulting log house, which could not have possibly been more difficult to construct, resembled a five sided teepee or asymmetrical pyramid. Inside it is spacious, with large sloping overhead windows, and lots of overhead space. They used beautiful rock from the surrounding area to accent the natural beauty of the wood, resulting in a home that is both a manifestation of Ward and Gloria’s love for each other and their love of the red-rock country that surrounded them. Ward's visionary craftsmanship, Gloria's artistic touches, and the love they shared together made the house a tribute to the spiritual bond between themselves and the land around them. Between 1978 and 1982 Ward spent at least half of his time working on a major revision to the voluminous Utah: A Guide to the State. In 1986 Ward published The Enchanted Wilderness, which may be his greatest legacy of all. Although the book had very limited distribution, it brought together a new generation of people who are inspired and motivated by the Enchanted Wilderness. Many people who read the book felt compelled to stop by Ward and Gloria’s house in Torrey, just to say hello and compliment the book. But most importantly, it brought together many enthusiastic red rock wilderness supporters who might never have met without it. There may never be a way to quantify the consequences of that, but future legislation relating to preservation of the Colorado Plateau my be a direct result of Ward and Gloria’s inspiration. In 1988 Ward and Gloria started producing video tapes relating to the red rock canyon country. In regard to these videos, Ward once told me, "What we strive for is to convey our sense of wonder that there could be such a place on earth, and that - being such a unique region, integrated in its features (physical personality) it should be treated with the greatest respect before development is allowed to change it." 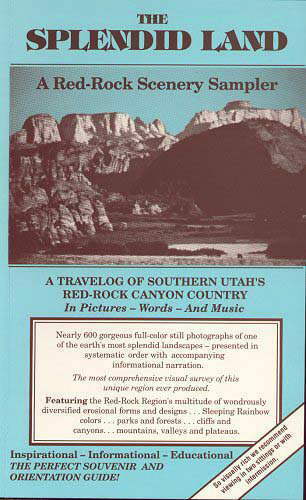 This Splendid Land: A Red-Rock Scenery Sampler served as an introduction to the region. 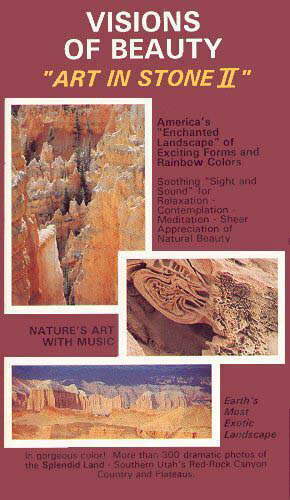 The Enchanted Wilderness: Art in Stone I was an introduction to the Art in Stone concept. Featuring hundreds of Ward’s photographs, it examined Red Rock Country from the standpoint of art and esthetics. Ward told me these videos were a labor of love for him. I find them to be beautiful and quite inspiring. Luckily, the Southern Utah Wilderness Alliance used some of the videos as membership incentives, and distributed at least a thousand copies. If you ever come across a copy of any of these tapes please share it with as many other people as possible. Gloria’s death in May of 1992 was devastating for Ward. Part of him, at least part of his enthusiasm, seemed to die along with her. She could animate and encourage him like no other person. 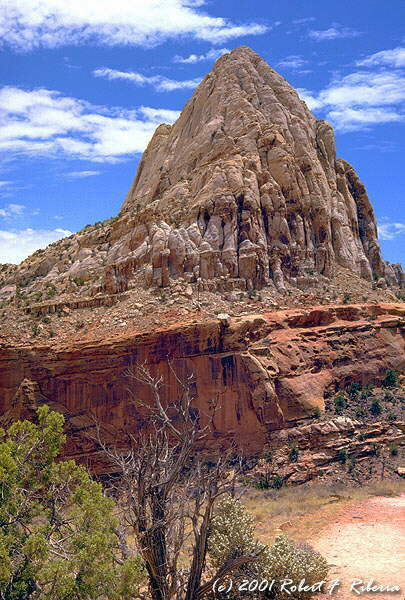 Ward continued to travel in and photograph Red Rock Country until his death in November of 1993. He is sorely missed by many, but his spirit remains in the heart of the Enchanted Wilderness. Ward Roylance's world travels sharpened his esthetic focus and gave him an intense sensitivity to the natural beauty of southern Utah, its "Art in Stone" as he called it. The landscape of southern Utah is a wonderland of erosional artistry. 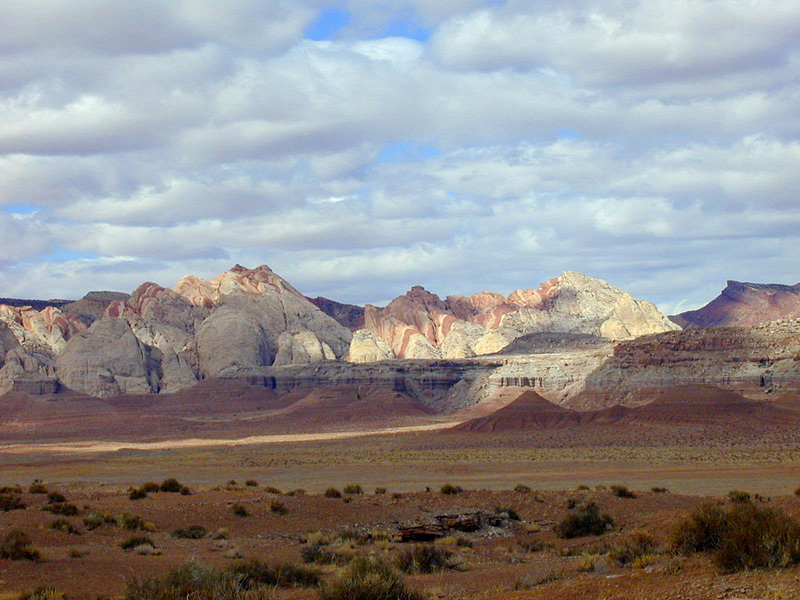 A unique combination of geological processes has resulted in a landscape with an infinite variety of color and form. Under conditions of constantly changing light, reality often becomes illusory. Surrealism is the rule of the day here. 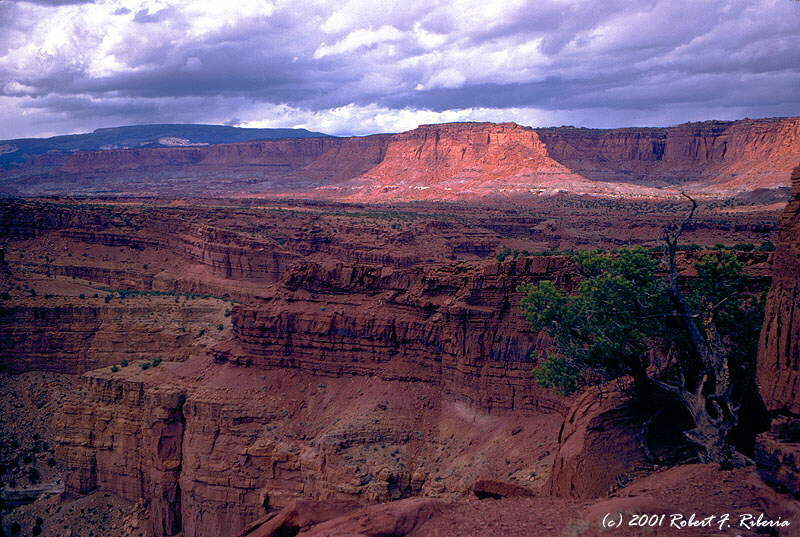 The landscape of southern Utah is a wonderland of erosional artistry. 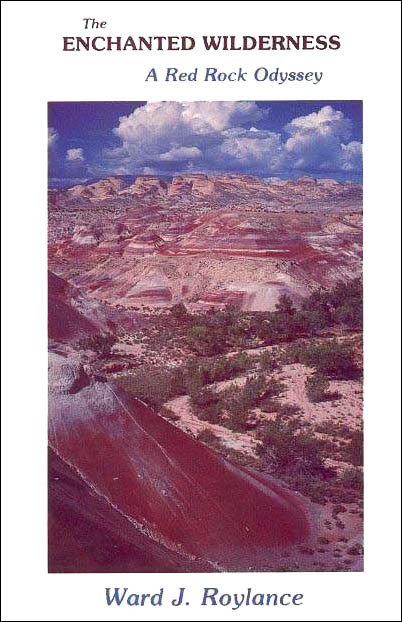 Its unique combination of geological processes has resulted in a landscape with an infinite variety of color and form. Under conditions of constantly changing light, reality often becomes illusory. Surrealism is the rule of the day here. The natural beauty of Red Rock Country stirs the emotions. Certain elements of its natural art are exquisite while others can appear bizarre, perhaps even grotesque at times. Like all truly great art, it stimulates the full range of human emotions. It takes control! An infinite variety of color, shape and form presents endless displays, and lessons, in art. Wandering around in this land can be a humbling experience. Mammoth formations tower overhead and seem to touch the heavens. From a distance their immense form overwhelms your perception of space. Distance seem erroneous, size becomes incomprehensible. The shear power of their creation is evident. Color and contrast dominate the scene at this level. Closer inspection of the cliff walls reveals an increasingly complex and intricate design. At this level the mastery and perfection of their design is evident. To move even closer to one of the monoliths drops one into absolute and total insignificance. It is a humbling, yet enthralling, experience. Unmatched in variety anywhere else on earth, the landscape of Red Rock Country presents artistic sanctuaries for the sensitive soul. Intricately carved walls, no two the same, each present a personal awareness of intentional design. Elegance and perfection of design on a scale unmatched anywhere else on Earth lies at the heart, and soul, of Red Rock Country. "Indescribable or unspeakable: That is the ineffable. The ineffable, by definition, is beyond expression." "What Gloria and I see from the heights of Thousand Lake Mountain and the Aquarius Plateau is, to us, ineffable. It is beyond expression, even comprehension. We look out upon a convoluted jumble of practically every landscape form imaginable - a library of earth history, a museum of nature's surreal art." "There are cliffs and buttes, mountains and mesas, canyons and valleys, domes and pinnacles, rounded slopes and numberless smaller forms, all painted in a rainbow spectrum of glorious hues, sculptured into shapes-designs-patterns that astonish with strange and endless diversity." "We cannot possibly do justice to those vistas in written or spoken words. We cannot even verbalize them to ourselves while looking. Language was not designed for the articulation of mystic profundities, or the conveying of emotional nuances, except in the vaguest way." "How could I describe, for instance, the overwhelming impression of vastness and visual impact - the sensation of being suspended as in a motionless plane, 4,000 feet above the most sublime exhibit of rock esthetics either of us has ever set eyes upon?" "Or how could I describe those powerful feelings of immemorial Time engendered by the ruins before us? The inexorable cycles of change and decay these ruins manifest - the inconceivable ages of creation and destruction they represent? The hopelessness we feel about ever possessing more than the merest fragment of knowledge about ancient landscapes that preceded the ones we see: their myriad life forms, the eons of their duration, the endless complexities of geological origins, causes and effects?" "As we look out from Thousand Lake Mountain and the Aquarius, impressions so ethereal they cannot be captured in words glide fleetingly through our consciousness. (Can those impressions even be termed thoughts?) They do not require words, they defy words, and they could not be conveyed with words." "Those impressions - those emotions - those convictions of the soul - are ineffable." "Most first time visitors to this region are overwhelmed by the landscape as a whole and by its larger, more striking features. There is far too much to assimilate at one time. Repeat visits are required - sometimes many visits before one becomes gradually aware of myriad smaller, more intricate, less obtrusive details that tend to elude the unpracticed eye." "I speak from long years of experience. My argument is supported by thousands of scenic photos which reveal definite change (I like to think of it as positive evolution) in my choice of subject matter. For 20 or 30 years I was so preoccupied with macrocosmic esthetics and marvels of earth structure that I hardly glanced at the smaller but more exquisite rock art that abounds throughout the red-rock country: marvelous reliefs, or free-standing, exotic mini-sculptures, or rock textures so beautiful they bring tears to the eyes." "These small-scale works of natural art have not replaced the landscape in our affections. Rather, they expand our world of appreciation enormously." "Some of those designs - many of them - make us cringe with delight. They are so beautiful! Seemingly so purposeful! They defy description. Or, more accurately, what defies description - what is inexpressible - is the idea of esthetic perfection behind the visible symbols cut into the rock. For many of these designs are esthetically perfect, insofar as we are qualified to judge: perfect in form, balance, and harmonious relationship between individual elements. Their spontaneous originality is breathtaking." "Whereas organic designs, and those created by people, tend to be stereotyped in cases, or formally geometric, or repetitious and stylized, every design carved in rock is an original. In inorganic art there seems to be no duplication or repetition. Line flow and form, in rock, have limitless variations in three dimensions." "Esthetic perfection in nature, as a concept, is hardly novel. Most people recognize it in flowers, sunsets, mountains, the forms of animal life, etc. So it is not surprising that rock forms also can provide the inspiration of "felt" perfection: for example, the gigantic "temples" of Zion and Capitol Reef...the rock forests of Bryce Canyon...the natural arches of Arches National Park and the Escalante...the spires and flowing rock of The Needles-Salt Creek country." "I have always found esthetic pleasure in rock art of that type, and not only in form and texture. Colors of the rocks in the Enchanted Wilderness are so marvelous, as at Bryce, or Cedar Breaks, or Capitol Reef, or in The Needles-Salt Creek country, or myriad other places." "The more one looks, the more (magically) there is to see. There can be no end to esthetic discovery in this land, because artistic stimuli are as omnipresent here as they are likely to be anywhere, with respect at least to inorganic art. The landscape here is one of idealized, archetypal forms: an intricate natural mosaic of surprise, expectation, anticipation, and excitement." "In sum: Unbelievably rich, inexhaustible diversity of form and design is one of the wonders of the Enchanted Wilderness. So, too, is the uniqueness or uncommonness of so many of these forms and designs. And the miracle of how they are perceived in forever-changing, never-the-same aspects, which vary according to time of day, conditions of the sky, seasons and weather. Not least, how marvelous is the dimensional range of natural phenomena from panoramic landscapes to exquisite rock designs of microcosmic size." One of the most important aspects of my life has been the immense honor of seeing some very special areas of southern Utah with Ward Roylance, who knew and appreciated the Red Rock Country of southern Utah better than any other person on Earth. Like many of Ward's friends, we were drawn together by his visionary book The Enchanted Wilderness. This book gives an inspiring and deeply philosophical view of the artistic aspects of Red Rock Country. Ward's lifelong love affair with this region resulted in a deep geological understanding of the landscape's physical qualities, and an acute awareness of its esthetic qualities. 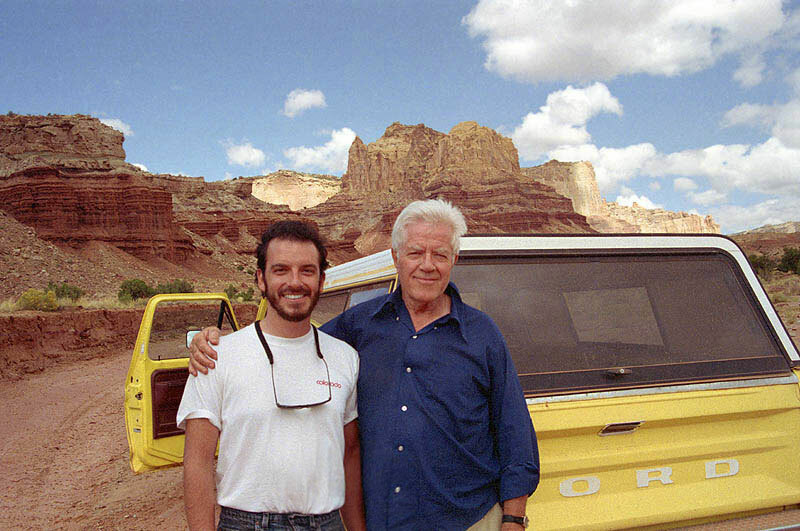 His knowledge and appreciation of Red Rock Country came from a life dedicated to a deep rooted passionate love for southern Utah's natural esthetics, which compelled him to explore as much of it as was humanly possible during the time he was here. In addition, Ward's world travels seemed to sharpen his esthetic focus and gave him an even more intense sensitivity to the natural beauty, the "Art in Stone" as he called it, of the land which was his home for most of his life. The following is the opening chapter from The Enchanted Wilderness. This book documents Ward’s visual awakening to the natural esthetics of Red Rock Country. Through his eyes we are given a new perspective on, and appreciation of, the "Enchanted Wilderness". Indescribable or unspeakable: That is the ineffable. The ineffable, by definition, is beyond expression. What Gloria and I see from the heights of Thousand Lake Mountain and the Aquarius Plateau is, to us, ineffable. It is beyond expression, even comprehension. We look out upon a convoluted jumble of practically every landscape form imaginable - a library of earth history, a museum of nature's surreal art. There are cliffs and buttes, mountains and mesas, canyons and valleys, domes and pinnacles, rounded slopes and numberless smaller forms, all painted in a rainbow spectrum of glorious hues, sculptured into shapes-designs-patterns that astonish with strange and endless diversity. We cannot possibly do justice to those vistas in written or spoken words. We cannot even verbalize them to ourselves while looking. Language was not designed for the articulation of mystic profundities, or the conveying of emotional nuances, except in the vaguest way. How could I describe, for instance, the overwhelming impression of vastness and visual impact - the sensation of being suspended as in a motionless plane, 4,000 feet above the most sublime exhibit of rock esthetics either of us has ever set eyes upon? Or how could I describe those powerful feelings of immemorial Time engendered by the ruins before us? The inexorable cycles of change and decay these ruins manifest - the inconceivable ages of creation and destruction they represent? The hopelessness we feel about ever possessing more than the merest fragment of knowledge about ancient landscapes that preceded the ones we see: their myriad life forms, the eons of their duration, the endless complexities of geological origins, causes and effects? As we look out from Thousand Lake Mountain and the Aquarius, impressions so ethereal they cannot be captured in words glide fleetingly through our consciousness. (Can those impressions even be termed thoughts?) They do not require words, they defy words, and they could not be conveyed with words. Those impressions - those emotions - those convictions of the soul - are ineffable. ". .. a riddle wrapped in a mystery inside an enigma," wrote Winston Churchill. He was speaking of the acts of Russia and not the messages of nature, but his words describe, as succinctly as a few words can, how Gloria and I regard the mysteries of the Enchanted Wilderness. Do we differ from other people in this attitude of reverential awe at nature's works in this land? Surely we do in some respects if not in all. This is a hypnotic place that casts a spell on those who are susceptible. Responses are all a matter of personal, temperamental idiosyncrasy. My emotional reactions and Gloria's are amazingly alike, being flavored by mysticism, resulting from an intimate, long-time, broad-range relationship with the Enchanted Wilderness not common to most people's experience. Familiarity has not brought contempt or satiation in our case. On the contrary, it has amplified our wonder and strengthened our conviction that what we perceive here in this magical land is only the slightest suggestion of what lies beneath the physical facade, indistinct but not quite hidden, waiting only for each individual to lift the veil according to personal inclination or capability. I have seen it with the wondering eyes of youth, and with older eyes that marvel still. I have probed it with the camera's eye, seeking essence that eludes. I examine it as a student of earth and learn it has no counterpart. I view its mysteries with impassioned love and discover sublimity. I see it as a vision; it is before me as a dream. Here I touch the ineffable grail. A mere listing of inspirational viewpoints in the Plateau region would fill pages. What is seen and felt from every one of them lies in the realm of the inexpressible. How do you verbalize Exaltation? Grandeur? The awesome? Eternity before your eyes? Adjectives fail. How do you even hint at the infinite nuances of inorganic art displayed here? Man's words do not serve well as conveyors of his deepest moods, his sacred thoughts and most-felt inexpressibles. Words are pale verbalizations of emotions that swell when faced with concepts too boundless to understand. What can we do, for example, when confronted with Grand Canyon's cosmic truths? Stand mute, perhaps (that's best), and muse about its nuances of time and immensity. And how do you articulate boundless Illusion wrought on forms of endless and exotic variety by shifting perspective, moving clouds, the amplifying or muting of light, shadings so mobile they change by the moment? "Through forms we can explore a world closed to rational thought," said an ancient Egyptian. What is Real in this bewitched landscape? Are there any natural Absolutes here that can be captured and solidified by the living eye? (By the camera, perhaps, which records a mere moment.) For the thinking person, illusion-reality-absolutes are of more than casual concern in this enchanted land. In Torrey our south windows look out over a sweeping expanse of fields, toward a horizon formed by the Aquarius Plateau. Great buttress slopes, dark and somber, flow down from precipices ringing the mountain's table crest. Low mesas and Cockscomb ridge provide middleground accent and perspective. The Cockscomb is a jagged exposure of light-colored Navajo sandstone, upthrust and fractured in some remote age by the Teasdale fault. Though not too remarkable either structurally or esthetically in this region of surpassing earth forms, it is a prominent landmark. When we glimpse it from Fish Lake Pass, 25 miles away, we know we are nearly home. The Cockscomb is meaningful to us as a symbol. It represents immutable reality and permanence on the one hand, unreality and illusion on the other. In miniature it typifies those qualities as they are found throughout the Plateau region. Several years ago I began photographing the Cockscomb at different times of day and seasons of the year, under varied weather and lighting conditions. Eventually I compared 20 or 30 of those photos. The results were fascinating. Every picture showed a radically different Cockscomb! Which was the "real" Cockscomb? All were real, of course; and all were illusions in the sense that they never appeared the same. Viewing from any fixed point affords only a tantalizing intimation of all the mystical qualities of this strange land. Awesome and inspiring as they may be, landscapes seen in overview are only grand mosaics - or they might be likened to the collective exhibits of a great museum of art as seen from a distance. The encompassing whole is marvelous; separate elements of the grand display, however, are indistinct. In the Enchanted Wilderness, as in a museum or with a great mural, stand-back viewing should be accompanied by close inspection for ultimate appreciation. Most first time visitors to this region are overwhelmed by the landscape as a whole and by its larger, more striking features. There is far too much to assimilate at one time. Repeat visits are required - sometimes many visits before one becomes gradually aware of myriad smaller, more intricate, less obtrusive details that tend to elude the unpracticed eye. which reveal definite change (I like to think of it as positive evolution) in my choice of subject matter. For 20 or 30 years I was so preoccupied with macrocosmic esthetics and marvels of earth structure that I hardly glanced at the smaller but more exquisite rock art that abounds throughout the red-rock country: marvelous reliefs, or free-standing, exotic mini-sculptures, or rock textures so beautiful they bring tears to the eyes. These small-scale works of natural art have not replaced the landscape in our affections. Rather, they expand our world of appreciation enormously. Near Torrey, for example, is an expanse of chocolate-colored, multi-layered sedimentary rock known as the Moenkopi formation. The area is extremely rugged, a fact not too apparent from a distance. It is, in truth, a labyrinth of steep-walled canyons, shallow in their upper ends, dropping off rapidly in sharp ledges to gorges that are hundreds of feet deep. Here is the epitome of ruin. Broken sandstone is everywhere, but those rocks create a fairyland of erosional artistry beyond description. Gloria and I have spent hundreds of hours in that weird land, hiking along the shattered rims and ledges, marveling at the wonderful designs that never exhaust the possibilities of surface and profile sculpturing. Worlds of art are here, worlds never dreamed by human mind, fantasies created from molecules by water and wind. Some of those designs - many of them - make us cringe with delight. They are so beautiful! Seemingly so purposeful! They defy description. Or, more accurately, what defies description - what is inexpressible - is the idea of esthetic perfection behind the visible symbols cut into the rock. For many of these designs are esthetically perfect, insofar as we are qualified to judge: perfect in form, balance, and harmonious relationship between individual elements. Their spontaneous originality is breathtaking. Whereas organic designs, and those created by people, tend to be stereotyped in cases, or formally geometric, or repetitious and stylized, every design carved in rock is an original. In inorganic art there seems to be no duplication or repetition. Line flow and form, in rock, have limitless variations in three dimensions. Esthetic perfection in nature, as a concept, is hardly novel. Most people recognize it in flowers, sunsets, mountains, the forms of animal life, etc. 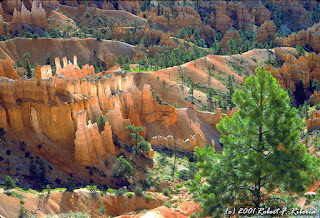 So it is not surprising that rock forms also can provide the inspiration of "felt" perfection: for example, the gigantic "temples" of Zion and Capitol Reef...the rock forests of Bryce Canyon...the natural arches of Arches National Park and the Escalante...the spires and flowing rock of The Needles-Salt Creek country. I have always found esthetic pleasure in rock art of that type, and not only in form and texture. Colors of the rocks in the Enchanted Wilderness are so marvelous, as at Bryce, or Cedar Breaks, or Capitol Reef, or in The Needles-Salt Creek country, or myriad other places. Trying to describe erosional forms is very difficult for me. 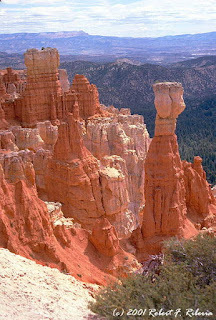 Particularly difficult to describe are intricately detailed sculptures, such as those at Bryce and Cathedral Valley, which are carved from layered rocks of varying thickness and differing resistance to erosion. In my personal lexicon, such forms represent the ineffable. 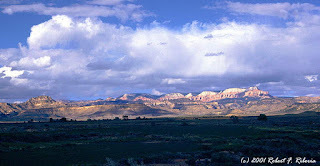 So, too, do some of the great dome-buttes of Zion and Capitol Reef and the San Rafael Swell. I am not capable of imagining designs more emotionally satisfying than those which nature has provided in the red-rock country (speaking here of inorganic designs), Oh, some purposeful touching-up and rounding-off of rough edges might be beneficial, but no major restructuring would be required to satisfy my esthetic standards. On the subject of arches: Since we have begun focusing from the large to the small, Gloria and I have discovered a fantastic microcosmic world of "openings" that surpass in complexity of design their larger counterparts. Even Delicate and Grosvenor arches - artistic masterpieces as they are - cannot compare in this way with literally countless small carvings on rock faces of the Enchanted Wilderness. These miniature creations display every conceivable variation of arch and window forms, combined with exquisite pillars, domes, alcoves, grottoes, pilasters and other architectural elements. 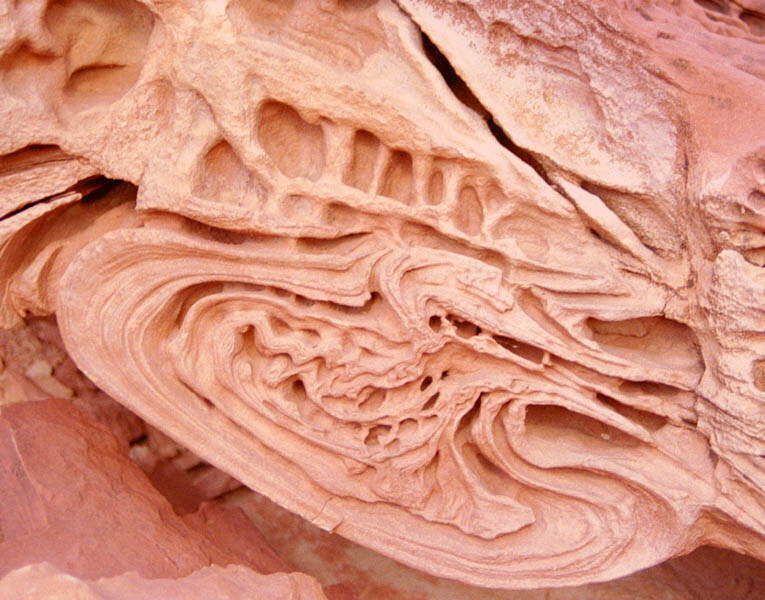 This type of mini-sculpturing occurs in many of the Plateau's rock layers, particularly on canyon walls where water has flowed at one time or another. Rock surfaces of the Capitol Reef area, for example, display countless exhibits of that nature; also North Wash between Hanksville and Lake Powell ...the Circle Cliffs...Factory Bench. The list of sites could be lengthened indefinitely. We have personal knowledge of only a few. Gloria and I are intrigued at the moment by rock-surface designs of the San Rafael and Morrison rock groups, which include the Carmel, Entrada, Curtis, Summerville, Salt Wash and Brushy Basin sandstones, mudstones and shales. Being relatively youthful, these rocks are fairly soft. They erode easily, and they have been carved into an astonishing variety of shapes and textures ranging from very small to very large. For example, the giant temple-buttes of Cathedral Valley and South Desert are products of those rocks, or several of them in combination. So are the many miles of sculptured cliff faces in that region. Those cliff faces, and the buttes themselves, flaunt an endlessly variegated display of relief and freestanding carvings that leave one speechless with admiration. If any exhibit of rock esthetics can be termed "ineffable", this region's can. I could go on, listing and describing points and places in the Enchanted Wilderness that display natural artistry approaching what Gloria and I consider the esthetic ideal. An important point I have tried to make here is that there is artistry in the Plateau region sufficient to satisfy anybody with artistic sensitivity - if not of this generation, then surely in future years. The more one looks, the more (magically) there is to see. There can be no end to esthetic discovery in this land, because artistic stimuli are as omnipresent here as they are likely to be anywhere, with respect at least to inorganic art. The landscape here is one of idealized, archetypal forms: an intricate natural mosaic of surprise, expectation, anticipation, and excitement. 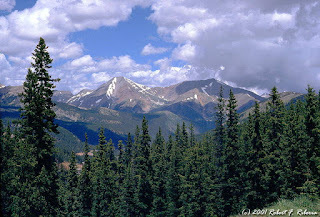 In sum: Unbelievably rich, inexhaustible diversity of form and design is one of the wonders of the Enchanted Wilderness. So, too, is the uniqueness or uncommonness of so many of these forms and designs. And the miracle of how they are perceived in forever-changing, never-the-same aspects, which vary according to time of day, conditions of the sky, seasons and weather. Not least, how marvelous is the dimensional range of natural phenomena from panoramic landscapes to exquisite rock designs of microcosmic size. Emotions overflow when I attempt, so feebly, to describe the Plateau as I know and feel it. After 40-odd years it is more wonderful to me than ever. Gloria and I cannot comprehend it, and know we never will. It conveys its multiple messages in complex cryptography, decipherable only by those who know the codes. Some of those codes we have mastered. Other people have succeeded where we have failed. But there are inexpressible messages yet waiting to be read. Of that we are convinced. 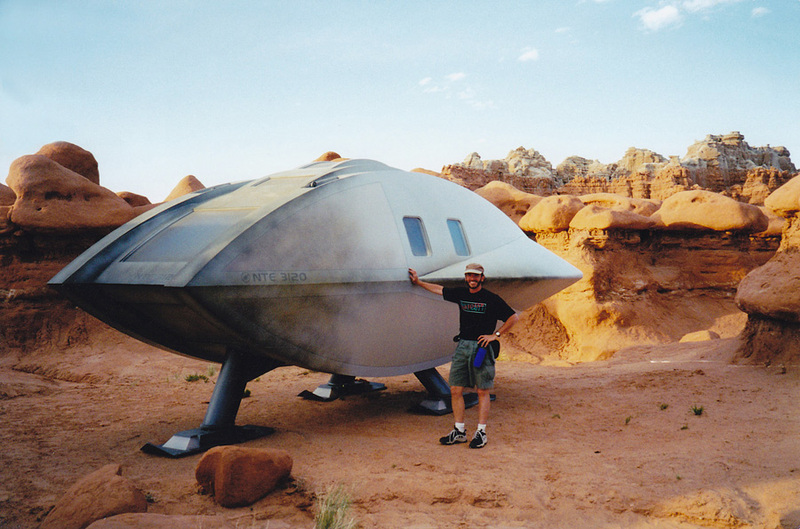 In the spring of 1999 my friend Roger from Fort Collins, Colorado, came to Moab for a visit. 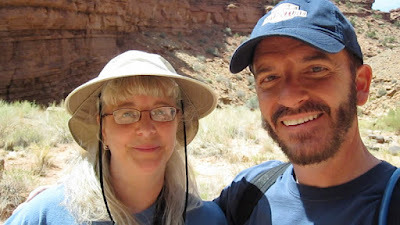 Roger and I had been friends for several years and had done some amazing hiking together, including a backpacking expedition into the remote backcountry of Canyonlands National Park. On this particular trip we planned to do a hike into Little Wild Horse Canyon, a slot canyon located in the San Rafael Swell not too far from Goblin Valley State Park. Rhonda and I had enjoyed rock hounding for years in the San Rafael Swell, so when I mentioned that Roger was coming out for a visit to hike in Little Wild Horse Canyon, she suggested coming along and being dropped off in the Swell for a few hours of rock hounding. The hike would only take a couple of hours, and Little Wild Horse Canyon was about a 30 minute drive from one of our favorite rock hounding locations. The area where we dropped Rhonda off for a "few hours". With our exciting day completely planned, Rhonda, Roger and I headed out on a beautiful spring morning. It was great to see Roger again, and we all had stayed up quite late the night before catching up on everything that had happened since Rhonda and I moved away from Fort Collins over a year ago. After dropping Rhonda off at her favorite rock hounding spot, Roger and I headed south toward Little Wild Horse Canyon while we continued to catch up on old times. We turned off the main highway and bounced down the rough road heading toward Little Wild Horse Canyon. After about 10 minutes we were surprised to see a flatbed truck parked along the side of the road with something unusual in its bed. I slowed down to take a look at the strange cargo which, much to our astonishment, resembled a spaceship! Now, it is interesting to note that I have an aerospace engineering degree. 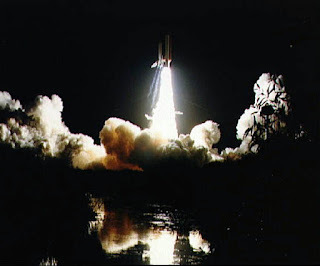 I fully understand the technology that took us to the moon and I have witnessed a Space Shuttle launch from closer than most other people on the planet. I live by the scientific method, and I have a logical explanation for just about every unusual experience that I have ever encountered. 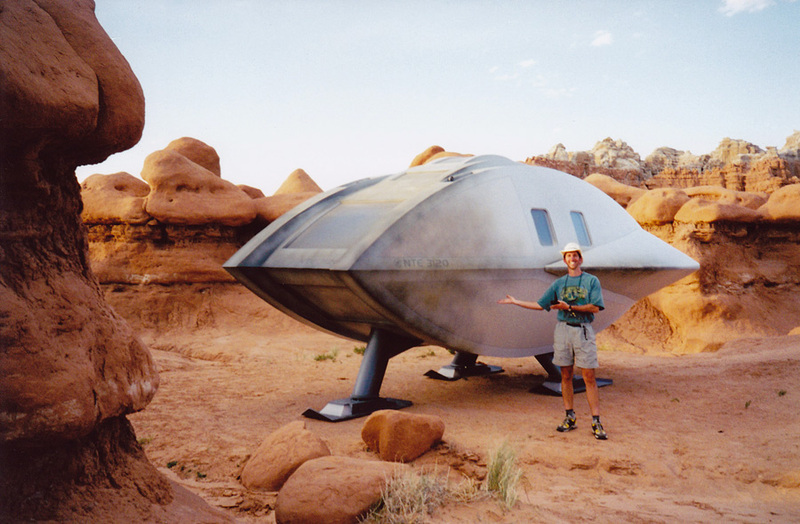 Yet here before me, in the middle of the desert, was an object that appeared to be some sort of bizarre flying machine. Yes, it looked like some sort of spaceship, sleek and futuristic looking, yet it also looked completely implausible – small and rather cheesy looking. 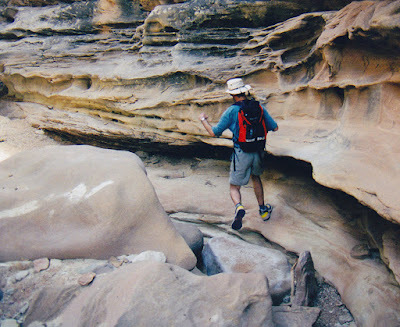 I wasn’t exactly sure what to make of it, but I knew one thing – I had 2 hours to get my friend Roger into the narrows of Little Wild Horse so that he could experience the intense beauty of one of the premier hiking spots in southern Utah. We reluctantly moved on. Roger and I continued down the long bumpy road to Little Wild Horse Canyon. 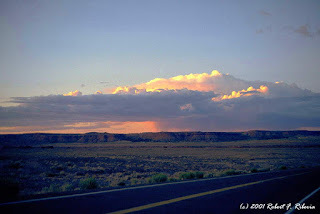 In 1999 the road was quite rough, we drove through deep sand and over rocky patches as we made our way to the trailhead. After parking and getting our hiking gear together, Roger and I headed down the wash that led to the mouth of Little Wild Horse Canyon. 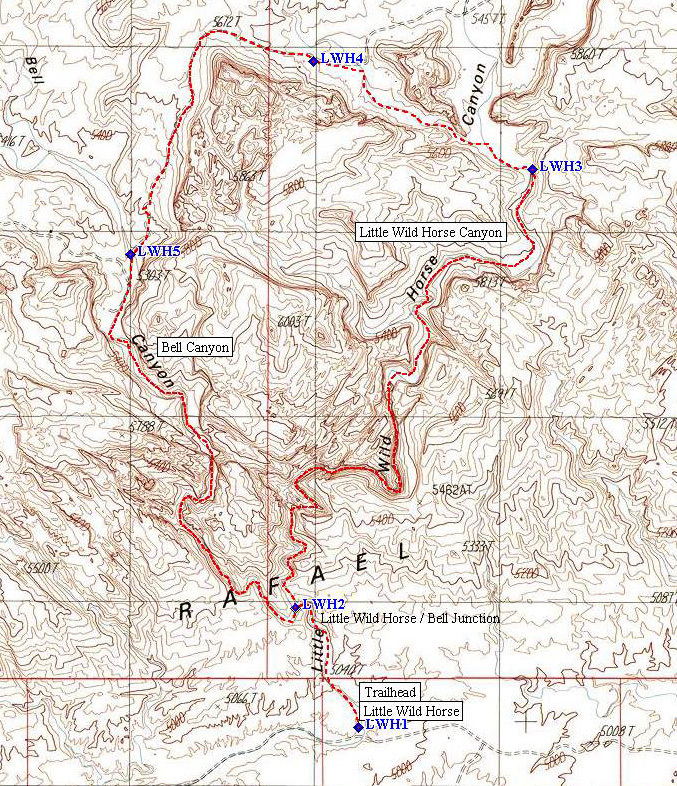 There are a couple of ways to hike Little Wild Horse Canyon. 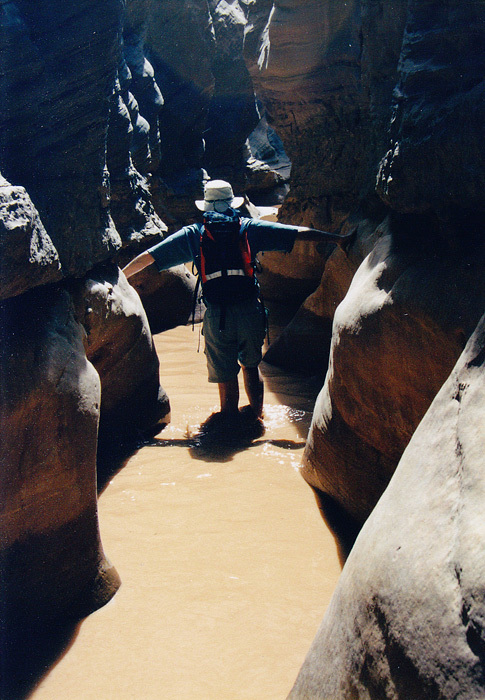 The quickest way is to simply down a long wash from the trailhead and enter the mouth of little Wild Horse Canyon. After another half mile we would reach the narrows. For the next couple of miles we would experience the beauty of sculpted canyon walls, with new and breathtaking views around every turn. After completing the narrows we could turn around and return to the trailhead, a hike of about 4.5 miles that takes no more than 2 hours. 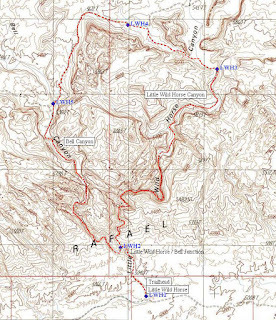 The other way to hike Little Wild Horse is to travel the entire length of the canyon, exit the back of the reef, and return via an adjacent canyon named Bell Canyon. Viewed from above, this entire hike takes the shape of a triangle so it makes a great loop hike. It is a beautiful hike, but about 9 miles in total length. Due to some rough sections it normally takes at least 5-6 hours to complete. Due to our limited amount of time, Roger and I decided to take the shorter route. Two hours was the amount of time that we had promised Rhonda and I was determined to adhere to it. Roger and I share a great love of the outdoors, so being able to share a hike into such a beautiful canyon with him was a total blast. Since we were still catching up, we continued to talk incessantly, spending more time listening to each other than to the terrain through which we were hiking. After about an hour it occurred to me it was taking much longer to reach the narrows than expected. We should have been in the narrows 30 minutes ago. I looked around and noticed that the canyon was widening instead of narrowing. It finally occurred to me that we had made a mistake and accidentally hiked into Bell Canyon instead of Little Wild Horse. Our options were limited, we could either turn around and hike back for about a half hour, or continue on and do the loop hike of nine miles. Being the guys that we were, we decided to hike forward at a greatly accelerated pace. Roger makes record time in Bell Canyon. 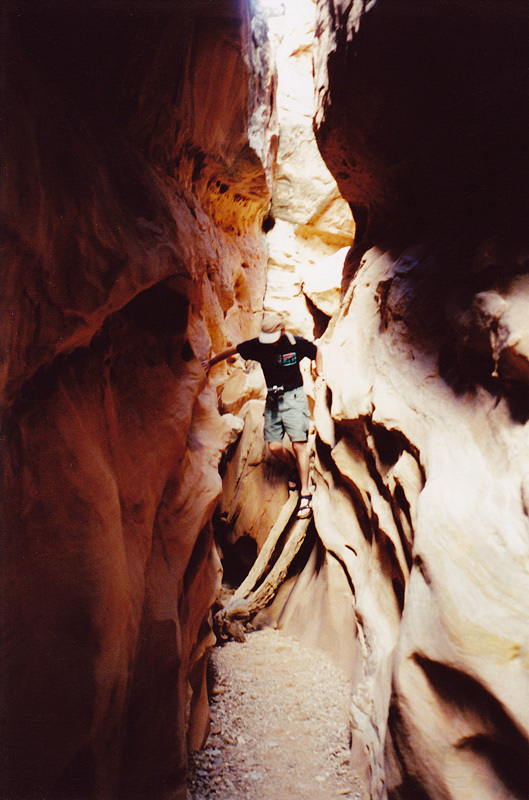 Roger in Little Wild Horse Canyon. Flooded sections slow us down. Rugged terrain slows us down. We literally flew through Bell Canyon. It was a breeze to hike quickly though this wide open canyon. In no time at all we reached the end of it and headed north. Within a half hour we reached Little Wild Horse and headed into it. Because of some recent rain we soon encountered some deep pools, many of them knee deep. Little Wild Horse also has some steep sections that require careful rock scrambling to navigate. Although we hiked the canyon in record time, it still took us over 2 hours to hike the length of Little Wild Horse. By the time got back to the trailhead we had already taken nearly 4 hours. Rhonda would no doubt be upset, but surely she would understand our predicament. We would only be a couple of hours late. As we headed back down the long bumpy road toward the highway we spotted another strange event, the “spaceship” that Roger and I had saw the back of the flatbed truck was now suspended from a helicopter and was headed out over Goblin Valley State Park! What the heck?!? Come on, who could resist the temptation to see what this is all about? My wife was already going to be angry with us, so what harm would a few more minutes be? 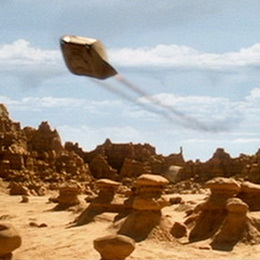 We arrived at Goblin Valley just as the spaceship was being lowered onto the valley floor. After some inquiries it didn’t take long to discover what was going on. 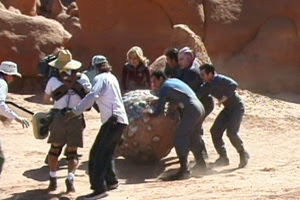 A portion of the science fiction movie Galaxy Quest was being filmed there, and the spaceship that we saw was an important prop for it. Up on the rim of the valley we saw numerous trailers for the cast and crew. (We later learned that the movie starred Tim Allen, Sigourney Weaver, Alan Rickman, Tony Shalhoub & Sam Rockwell.) Much to our surprise, we were still allowed to hike into the valley. We were also amazed to discover that we were the only people in the valley! Who on this Earth could pass up that opportunity?!? Roger and I headed down into Goblin Valley. Unfortunately the spaceship wasn’t near the front of the valley, it was toward the back. After about 30 minutes we arrived at the spaceship. It was awesome looking. Sure it was a Hollywood prop, but it looked pretty darn cool, with a charred exterior that looked as if it had entered the Earth’s atmosphere in a fiery blaze. Like a couple of school kids we scurried around the craft and took pictures of each other posing next to it. What an incredible experience this was, being on the set of a science fiction movie! After about 20 minutes we decided that we’d better head back. We were already 3 hours late for our rendezvous with Rhonda, but surely she would understand. At least, that’s the way a couple of clueless guys looked at the situation. We made our way back to the highway and headed north. Driving 25 miles per hour over the speed limit I thought that perhaps I could make up the 3-4 hours that we were late. After what seemed to be an eternity I turned onto the dirt road where we had left Rhonda. Within 15 minutes I finally spotted her, backpack slung over her shoulder as she walked along the road. I couldn’t wait to tell her about everything that happened to us! Rhonda hurtled her backpack into the bed of the truck and firmly exclaimed, “Turn around!” Roger and I exchanged clueless male expressions as I turned the truck around. In a manner completely out of character for Rhonda she climbed into the bed of the truck and yelled, “Drive!” If you know Rhonda you would know that she would never ride in the open bed of the truck, at least up until that point of her life. There was only one thing that would cause such an incredible deviance from her normal behavior and that was anger. When we reached the highway I got out of the truck to coax her back into the vehicle. Rhonda shook her head and got into the truck. Luckily, it was a 90 minute drive back to our home in Moab. It took us just about that entire amount of time to convince her of what had happened, but in the end we had some memories that would last a lifetime, memories that well up every time we watch the movie Galaxy Quest together. Excerpts from John Van Dyke's "The Desert"
Although his wanderings took him into the Sonoran Desert, many of his impressions relate quite well to the Great Basin Desert, and particularly to the Red Rock Country of the Colorado Plateau. His acute visual perceptions of the desert environment stem from his life’s work concerning art theory and visual perception. His eloquent use of language serves as the perfect vehicle for conveying the mesmerizing beauty of the desert. When Van Dyke entered the desert for the first time he beheld one of the grandest displays of art he had ever imagined. Like many other who have experienced the wonder of this extraordinary land, he struggled to convey in words the grandeur of the desert. In my opinion, he succeeded rather well. It’s pretty clear that Van Dyke had an intense and passionate love affair with the desert’s beauty. His book, The Desert, is a classic account of desert esthetics. First published in 1901 it has been widely acclaimed by noted authors such as Edward Abbey and Joseph Krutch. Below are a few of my favorite excerpts. If you enjoy this small sample of his work, you will love the rest of the book. "This is a land of illusions and thin air. The vision is so cleared at times that the truth itself is deceptive." "The waste places of the earth, the barren deserts, the tracts forsaken of men and given over to loneliness, have a peculiar attraction of their own. The weird solitude, the great silence, the grim desolation, are the very things with which every desert wanderer eventually falls in love." "It is stern, harsh, and at first repellent. But what tongue shall tell the majesty of it, the eternal strength of it, the poetry of its wide-spread chaos, the sublimity of it's lonely desolation! And who shall paint the splendor of its light; and from the rising up of the sun to the going down of the moon over the iron mountains, the glory of its wondrous coloring! It is a gaunt land of splintered peaks, torn valleys, and hot skies." "The desert mountains gathered in clusters along the waste, how old and wrinkled, how set and determined they look! Somehow they remind you of a clinched hand with the knuckles turned skyward. They have strength and bulk, the suggestion of quiescent force. Barren rock and nothing more; but what could better epitomize power! The heave of the enormous ridge, the loom of the domes top, the bulk and body of the whole are colossal." "And there you have the most decorative landscape in the world, a landscape all color, a dream landscape. Painters for years have been trying to put it upon canvas - this landscape of color, light, and air, with form almost obliterated, merely suggested, given only as a hint of the mysterious. Men like Corot and Monet have told us, again and again, that in painting, clearly delineated forms of mountains, valleys, trees, and rivers, kill the fine color-sentiment of the picture. The great struggle of the modern landscapist is to get on with the least possible form and to suggest everything by tones of color, shades of light, drifts of air. Why? Because these are the most sensuous qualities in nature and in art. The landscape that is the simplest in form and the finest in color is by all odds the most beautiful." "Are they beautiful these plants and shrubs of the desert? Now just what do you mean by that word 'beautiful'? Do you mean something of regular form, something smooth and pretty? Are you dragging into nature some remembrances of classic art; and are you looking for the Dionysius face, the Doryphorus form, among these trees and bushes? If so the desert will not furnish you too much of beauty. But if you mean something that has a distinct character, something appropriate to its setting, something admirably fitted to a designed end (as in art the preasante of Millet or burghers of Rembrandt and Rodin), then the desert will show forth much that people nowadays are beginning to think beautiful. Mind you, perfect form and perfect color are not to be despised; neither shall you despise perfect fitness and perfect character." "Nature never designed more fascinating country to ride over than these plains and mesas lying up and back from the desert basin. You may be alone without necessarily being lonesome. And everyone rides here with the feeling that he is the first one that ever broke into this unknown land, that he is the original discover; and that this new world belongs to him by right of original exploration and conquest. Life becomes simplified by necessity. It begins all over again, starting at the primitive stage. The is a reversion to the savage. Civilization, the race, history, philosophy, art - how very far away and how very useless, even contemptible, they seem. What have they to do with the air and the sunlight and the vastness of the plateau! Nature and her gift of buoyant life are overpowering. The joy of mere animal existence, the feeling that it is good to be alive and face to face with Nature's self, drives everything else into the background." "The Canyon country is well named, for it has plenty of wash outs and gorges. Almost anywhere among the mountain ranges you can find them - not Grand Canyons, to be sure, but ones of size sufficient to be impressive without being stupendous. Walls of upright rock several hundred feet in height have enough bulk and body about them to impress anyone. The mass is really overpowering. It is but the crust of the earth exposed to view; but the gorge at Niagara and the looming shaft of the Matterhorn are not more. The imagination strains at such magnitude. And all the accessories of the gorge and canyon have a might to them that adds to the general effect. The sheer precipices, the leaning towers, the pinnacles and shafts, the recesses and caves, the huge basins rounded out of rock by the waterfalls are all touched by the majesty of the sublime." "In sublimity - the superlative degree of beauty - what land can equal the desert with its wide plains, its grim mountains, and its expanding canopy of sky! You shall never see elsewhere as here the dome, the pinnacle, the minaret fretted with golden fire at sunrise and sunset; you shall never see elsewhere as here the sunset valleys swimming in a pink and lilac haze, the great mesas and plateaus fading into blue distance, the gorges and canyons banked full of purple shadow. Never again shall you see such light and air and color; never such opaline mirage, such rosy dawn, such fiery twilight. And wherever you go, by land or by sea, you shall not forget that which you saw not but rather felt - the desolation and the silence of the desert." "Look out from the mountain's edge once more. A dusk is gathering on the desert's face, and over the eastern horizon the purple shadow of the world is reaching up to the sky. The light is fading out. Plain and mesa are blurring into unknown distances, and mountain ranges are looming dimly into unknown heights. Warm drifts of lilac-blue are drawn like mists across the valleys; the yellow sands have shifted into a pallid gray. The glory of the wilderness has gone down with the sun. Mystery - that haunting sense of the unknown - is all that remains. It is time that we should say good-night - perhaps a long good-night - to the desert." Since first putting up this website it has been my pleasure to help quite a few people plan their first trips into southern Utah. Many people have asked what my first trip was like. This page is in response to those inquires. Southern Utah is big. Since the first day that I visited here I have struggled with the correct words to describe it - vast, expansive, immense - nothing seems quite able to capture it. The rocks are big, the boulders are massive, the buttes are huge, the mesas are colossal, the mountains are immense, and the landscape is, frankly, overwhelming. I grew up in the northeast section of the United States, by the Great Lakes. Those lakes were big, I thought. Water, as far as the eye could see. Even with binoculars you could only see water, until it rolled over the edge of the Earth. Now that was a lake - a Great Lake. I traveled up and down the east coast of America, visiting all the great cities - New York, Boston, Washington, Atlanta, Miami. They really are big cities - millions of people and lots of big buildings. It was fun exploring the "canyons" of New York, tilting my head back to see the tops of the skyscrapers, looking very much like the tourist that I was. Skyscrapers - now there's a word for you. Buildings so big they scraped the sky! I grew up in a time of wonderful dreams. When I was a kid men wanted to go to the Moon. I would stare up at the sky at night, watching the moon slowly move across the sky. It was a big target, but an awfully long distance to travel. How could we get there? How would we survive the journey? How would we land? How would we get back? I had a lot of questions for a kid. I knew it would be a big project and require big machines. It captured my imagination. The launch of STS-51i that I watched on August 28, 1985.
watched on August 28, 1985. I learned everything that I could about space and astronomy. I loved following the early space program - Mercury and Gemini. When the Apollo program came along, it was almost too much to absorb. I dove into it and wound up with an Aerospace Engineering degree. I stood next to colossal moon rockets, stuck my head inside enormous rocket engines, and walked around inside a massive assembly building that was so huge clouds formed inside of it. In August of 1985, while standing in a Florida swamp watching Space Shuttle Discovery leave the Earth, I decided that maybe, just maybe, I had seen it all. Not only did the force of that shuttle rip through my chest, but more importantly to me at that time, I actually understood how it all worked. It was a marvel, and a pretty big one at that. Little did I know that within a year everything that I had previously experienced would become almost insignificant. Within a year I would visit southern Utah for the first time. Long before I ever even thought about visiting Utah, my friend David Klash spent over a month in Colorado and Utah in a Geology Field Camp, which was a required part of his college curriculum. Although the majority of his time was spent doing mapping and field studies, he did have some time to do a bit of sightseeing. Dave would send me weekly postcards describing his journey. I looked forward to each card, which bore images of places neither of us had seen before. His cards from Colorado were beautiful, but the cards that he sent from Utah contained pictures unlike any I had ever seen before. Dave and I are both explorers, although up until that point our joint explorations consisted mostly of urban journeys - seeking out bigger and bigger cities. We also shared a fascination with astronomy - which often led us to drive for hours at night trying to find the darkest possible locations for stargazing. The original postcard that Dave sent me, dated June 4, 1983. It's now quite faded and yellowed. One small sentence that would ultimately change the direction of my life. Although the pictures on all of Dave's postcards were interesting, the one that portrayed the Goosenecks of the San Juan River really caught my eye. The picture was visually striking, and Dave's inscription on the back really caught my attention. "Last night I stepped out of the tent and the sky was plastered with stars! We have to come out here on a scenic trip sometime…" I'd never really considered exploring the western states, but Dave's series of postcards and first hand descriptions, made it sound pretty exciting. Years passed. Dave and I were rather young and financial circumstances precluded a scenic tour of the "Great West" for quite some time. But things finally came together in the summer of 1986. We scraped together enough money to fly to Denver, Colorado, rent a car, and then drive though all of the National Parks of southern Utah. Colorado is mountains. The largest mountains I had ever seen outside of Colorado were quite small - barely mountains by Colorado standards. The Appalachians in New York hardly attain heights of 5000 feet. In Colorado the snow-capped peaks soared to over 14,000 feet. I was awestruck - I had never seen anything so beautiful. Even Interstate 70, which is the main highway that crosses the state, contained scenery far superior to anything I had ever seen before. We kept pulling over to absorb the scenery - every turn seemed to hold something new - more mountains - waterfalls - beautiful trees - I was in Heaven! After driving across Colorado, crossing the Continental Divide at Monarch Pass, we headed toward the "Western Slope" of Colorado. Just when I was getting used to looking up at the mountains, we stopped at the Black Canyon and gazed down 1000 feet to the Gunnison River. The river was so far away I couldn't even hear it. The canyon is actually 53 miles long, but only the most spectacular 12 miles are located within the boundaries of the National Monument. 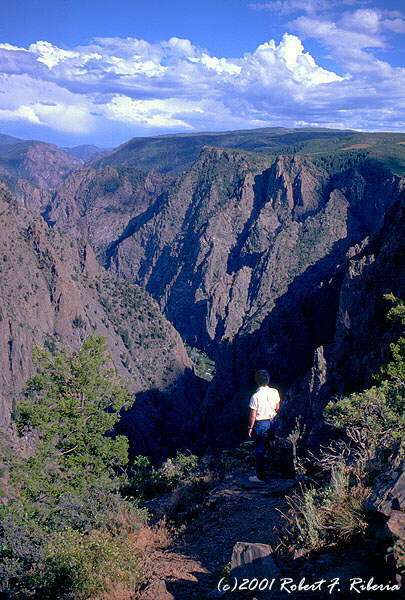 The Black Canyon can be best described in one word - narrow. No other canyon that I had seen had such an impressive combination of narrowness, depth, and precipitous walls. I could look straight down for almost half a mile at many of the viewpoints! 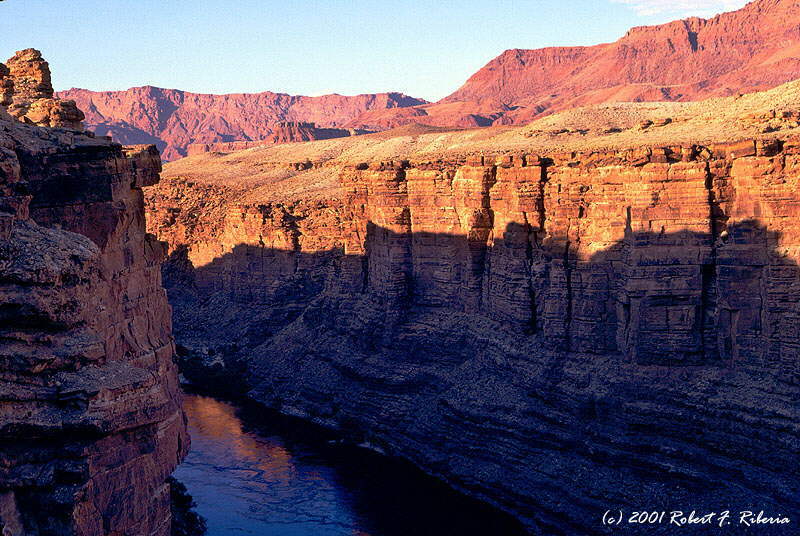 In some places the width of the gorge was barely over 1000 feet, yet its depth can reach well nearly half a mile. 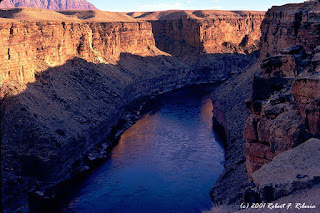 Because of the canyon's narrowness, sunlight only penetrates down to the river for a small part of the day. The dark gray walls of schist and gneiss spend most of the day in shadow, thus the name Black Canyon. The steep walls of the canyon were barren, but up on the heavily forested rim the smell of pine trees permeated the air. At some overlooks, the sound of the river far below could be heard. White throated swifts soared over the edge at dizzying speeds and then plunged down into the canyon's depths. Swifts are tiny birds with very swept wings and resembled, at least to me, fighter jets. Swarming beneath the rim in a frenzied aerial ballet, they luxuriated in the majesty of their surroundings. After leaving the Black Canyon we continued west. The landscape continued to become a bit more open, and mountains started to give way to mesas. One thing that will always stick out in my mind from that first trip was my reluctance to continue our trip into Utah after I had seen Colorado. As Dave and I spent the night in the Grand Junction, I could see that the landscape was already starting to "dry up". The snow-capped peaks were gone - the lush mountain meadows were gone - the green was disappearing. Dave assured me that the best was yet to come, but I really found that hard to believe! Dave dragged me into the car the next morning and we headed into Utah. As we drove across the state line I felt as if we were making a big mistake. "Man, Dave is pretty inflexible and unyielding with our plans", I thought as we sped into the rather bleak looking landscape of eastern Utah. The barren hills of eastern Utah are so dry and parched looking that my father-in-law, on his first visit to the section of Utah many years later, would ask me if there had been a fire. The was no doubt about it, we were heading into a desert. I-70 is a straight line across the state of Utah. You could set your vehicle on cruise, lock the steering wheel straight ahead, and climb out of the driver's seat for an hour or two (only a slight exaggeration). However, it didn't take long until the rolling hills became back-dropped by giant, stately mesas. The landscape was primarily gray and tan, but it was developing a stark beauty. Buzz Aldrin, upon exploring the surface of the moon for the first time, remarked that it had, "…a stark beauty all its own. Much like the high deserts of the United States…" This, I thought, is exactly what the moon is like. The gray rolling hills, completely devoid of vegetation, were the closest thing I could imagine to the lunar surface. That was cool. I had to stop the car and run around on them. It was fun! 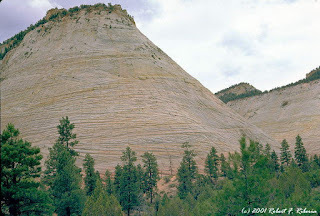 Those rolling hills, it turns out, are part of the Mancos Shale formation which is rich in marine fossils, including sharks teeth. Had I known that at the time, I would have found the hills to be even more fascinating. Although I didn't notice it at the time, as I ran around on those barren gray hills having an absolutely wonderful time, my fascination with the mountains of Colorado was already starting to fade. Utah was… different! 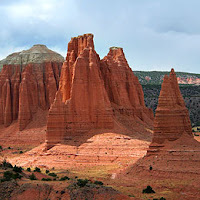 Our initial plan called for us to spend some time in southeastern Utah, see Arches and Canyonlands National Park, and then move west to see Bryce and Zion National Parks. As we pulled into the town of Moab, just outside Arches National Park, it was raining quite heavily. We checked the forecast and the rain wasn't expected to subside until the next day. It was, however, clear on the other side of the state. With only a week to spend we didn't have an extra day to wait for the rain to stop. We made an immediate change in plans and decided to see Bryce and Zion first, and then make our way back to Moab. That meant driving across the entire state of Utah on my first day in the state. Little did I know how much that would change my life. Our route would take us back up to I-70, then down along the San Rafael Reef into central Utah, turn west through a completely unknown area, and finally head south into the Bryce Canyon area. 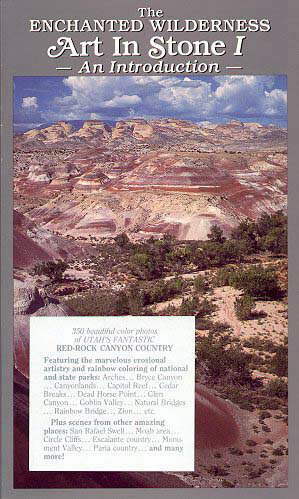 I remember looking on a map at something called "Capitol Reef" and not having the vaguest notion what it was. The drive from Hanksville to Capitol Reef National Park left me completely speechless. The gray mesas and unique rock formations near Hanksville are the most unearthly in all of Utah. As we continued to drive west, though a constantly changing landscape of mesas, buttes, bluffs, spires and monoliths, the landscape started to change color. The palette expanded to include rolling hills of purple, green, and brown. The soil started to change - from coarse abrasive pebbles - to fine textured, soft colored sand. The color continued to evolve into warm hues - salmon, pink, and light brown. The harsh lines and coarse erosional structure of the previous mesas started to evolve into smoother lines and finer patterns. The landscape seemed to become more inviting. Not only had I never seen anything like this before, I had never even dreamed of anything like this before. The landscape truly was, beautiful. Highway 24 just happens to pass through the heart of Capitol Reef National Park. The human heart is a warm, somewhat vulnerable place from which true joy seems to emanate. The heart of Capitol Reef is much the same. The Fremont River passes through this section of the park, along the highway in many sections. 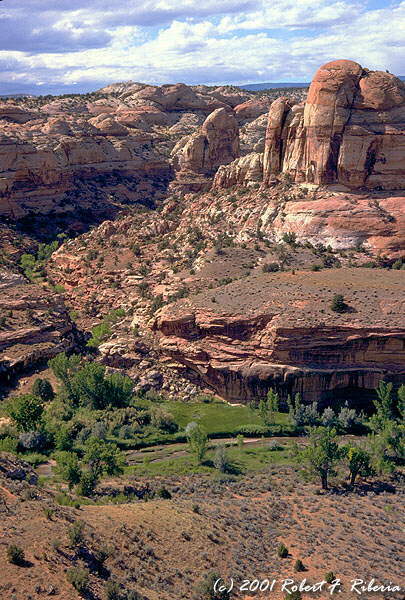 In a desert, a river can mean an oasis, and in Capitol Reef that oasis is a lush green river of the life that passes through the center of the park. Not only do tall cottonwood trees line the banks, but it the center of the park there are a series of fruit orchards that produce quite a healthy harvest of fruit every year! Mule deer wander beneath the trees, birds fill the air - it was like a dream in the center of the desert. The line between dream and reality was starting to fade. It seemed that all of a sudden the reds literally exploded around us. Unearthly monoliths, pillars, and massive domes towered overhead. I felt as if I had left the planet. Giant plateaus, tilted strata, twisted canyons, unbelievable color, and lush dashes of green wherever water flowed. Junipers, cottonwoods, willows, and dashes of wildflowers created streams of life which flowed throughout the park. For my entire life I had never imaged that such a landscape existed on the entire planet, let alone in my own country! Awestruck does not even come close to expressing how I felt. I found myself becoming very quiet. For the first time I was discovering that I lacked adequate words to describe what I was experiencing, something which torments me to this day. It was as if I wasn't the one in control. I wanted to simply visually embrace the land, yet instead it reached out and emotionally grabbed me. My pulse quickened, my breathing deepened, and it touched me, it touched my soul. It pulled out emotions I did not know that I had inside of me. It was in total control. 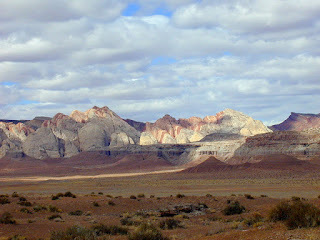 When we first arrived in Capitol Reef it was still heavily overcast. Of course, overcast illumination can actually enhance some of the landscapes in southern Utah, and Capitol Reef was no exception. It's soft colors are enhanced with the delicate light of an overcast day. As the day wore on, the sun would occasionally break through the clouds providing dramatic illumination for the varicolored landscape. We made several stops, did a few hikes, and by mid afternoon the sky began to clear. It turned into a beautiful day and I found myself immersed within a landscape that, prior to that day, I had never even imagined existed. The boundaries of my world were expanding by the minute. After leaving Capitol Reef, we turned south onto Highway 12 to continue our journey to Bryce Canyon. When I made that turn I was less than two miles from the home of Ward Roylance, the man who would later be instrumental in the future direction of my life. I wouldn't meet Ward for another six years. Back in 1986, it just wasn't yet meant to be. Highway 12 passes through, what is today, Grand Staircase - Escalante National Monument. A jumble of convoluted canyons and contorted rock formations, the Escalante area presented yet another face of southern Utah. Here, white and light colored sandstone dominated the view. The red rock scenery surrounding Capitol Reef yielded to more subdued hues, however, the landscape became infinitely more complex. There seemed to be no straight lines in this region, the road twisted and turned as it made its way southwest toward our destination. There was no easy way through that country. Switchbacks, tight turns, and harrowing hogbacks defined much of that stretch of road. Every turn, however, held something new. Some scenes along Highway 12 in Southern Utah - a diverse, geological wonderland. "...Now there's something you don't see everyday..."
Man, what an understatement! 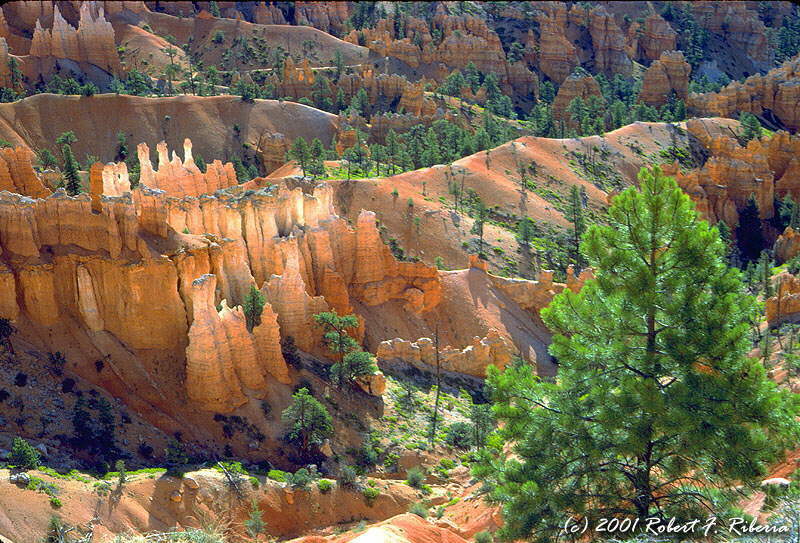 Bryce was a glorious sandstone landscape eroded into an unimaginable fantasyland of pure color and form. This, I thought, was pure Heaven. We camped near the Red Canyon (not too far from Bryce) in an area surrounded by a grove of trees that obscured our view of the night sky. After setting up our tents in the dark, we grabbed our flashlights and headed up a neighboring slope to a ridge about 100 feet above our camp site. Knowing that the sky was crystal clear that night we took one final look at each other, turned off our flashlights and looked up. Everything that Dave had told me about the night sky was true. The Milky Way arced high overhead. Dark dust lanes stood out in stunning relief. There were so many stars visible that even recognizing the major constellations was difficult. The beautiful Lagoon and Triffid Nebulae were visible to the naked eye, something I never thought would be possible. The stars somehow felt closer. I didn't feel like I was looking at the Universe, I felt as if I was part of it. 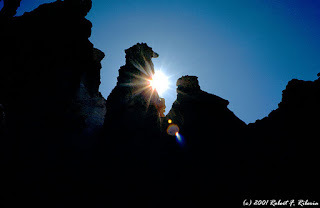 The following day we explored the rim of Bryce Canyon, and then hiked down to the bottom. Everyone visiting southern Utah should experience Bryce Canyon - there is simply no other place quite like it. Scenes from Bryce Canyon National Park. There are 2 ways to experience this park - from above and from below. Both are equally spectacular, and well worth doing! The following day we explored parts of Zion National Park, which presented yet another face of southern Utah. Zion National Park contained nearly 300 square miles of cliff and canyon studded wilderness. Lofty monolithic sandstone formations towered high overhead and dominated the view from just about anywhere in the park. The imposing size of these colossal formations have inspired such godly names as Temple of Sinawava, Angels Landing and The Great White Throne. Upon entering the park from the east entrance, we were immediately surrounded by contorted forms of very light colored, nearly white in fact, sandstone. The delicate red sandstone that dominated much of southern Utah could often be crumbled with your bare hands. However the white sandstone of Zion, called Navajo Sandstone, was very solid and strong, somewhat like concrete. The hardness and strength of this rock seemed to contradict the twisted contours of the formations. But surprisingly, those misshapen rocks were not caused by tremendously violent geologic forces. 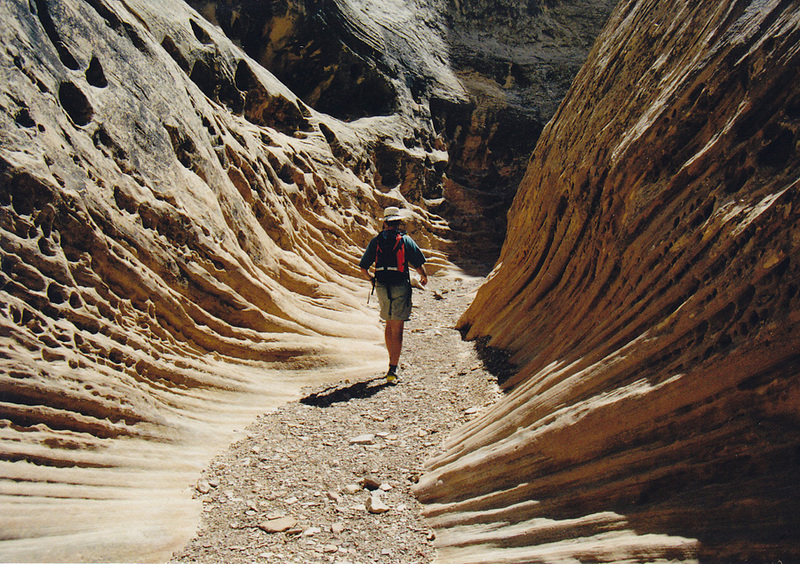 Navajo sandstone is mostly petrified sand dunes from millions of years ago. The dunes were compressed from the weight of sediments deposited above them, sediments which were subsequently eroded away due to changing conditions in the environment. So in reality, the twisted contours are the result of relatively gentle deposition and compression. Beautiful streaks of slightly varying direction in the sandstone, called crossbedding, is caused by changing wind currents eons ago. One doesn't have to drive far in Zion to notice that all of the roads were dark red in color. Red sandstone, which was abundant in portions of the park, had been used as part of the pavement. The appearance of the road seemed to accent the natural beauty of the surroundings. Shortly after entering the park we came upon "The Tunnel". The Tunnel, 1.1 miles long, had been blasted through solid rock cliffs to make the park easily accessible to vehicles. 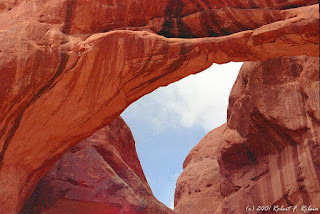 As we entered the tunnel we were still surrounded by the white sandstone formations that I spoke of. However when we exited, the surroundings had been transformed into the vividly colored mighty cliff walls of Zion Canyon. The Virgin River runs through the heart of Zion, creating the same type of "river of life" along its banks that we had noticed in Capitol Reef. Zion was another lush green oasis in the midst of the desert. After visiting Zion we headed into Arizona to see the North Rim of the Grand Canyon. My initial impression of the Grand Canyon was, simply, that it was big. Now, don't get me wrong - "big" things are what got me started on all of this. The canyon's dimensions once again exceeded my expectations. To this day, when I'm asked about the Grand Canyon, my typical response is "it's big". I certainly enjoyed seeing the Grand Canyon - it was yet another experience to add to an incredible week of exploration. However, I did feel as if the colors were subdued compared with the canyons of southern Utah. Although the Grand Canyon is definitely a true wonder of the world, I find the canyons of southern Utah to be more esthetically diverse and pleasing. However, I will say that after visiting the south Rim of the Grand Canyon several times during the following decade and I have come to appreciate the views, and lack of crowds, on the North Rim. Our next destination was Meteor Crater in northeastern Arizona. The aerospace portion of me felt that I had to see this. The area surrounding the crater was rather desolate and quite flat. As we approached the crater the only vertical relief visible was the ejecta rim, which from ground level actually looked like nothing more than a small mesa. There were several other similar features in the area, of about the same height, which made Meteor Crater blend in perfectly to the local topography. Before we actually ascended to the lip of the crater, we would never have guessed that it was a crater. How many people from long ago passed right through this area without giving it a second thought? Since there were no tall hills or mountains nearby, the only way to get a look at the crater would have been to actually climb it and look inside. I would guess that most folks would have had no inclination to climb up top and take a look. 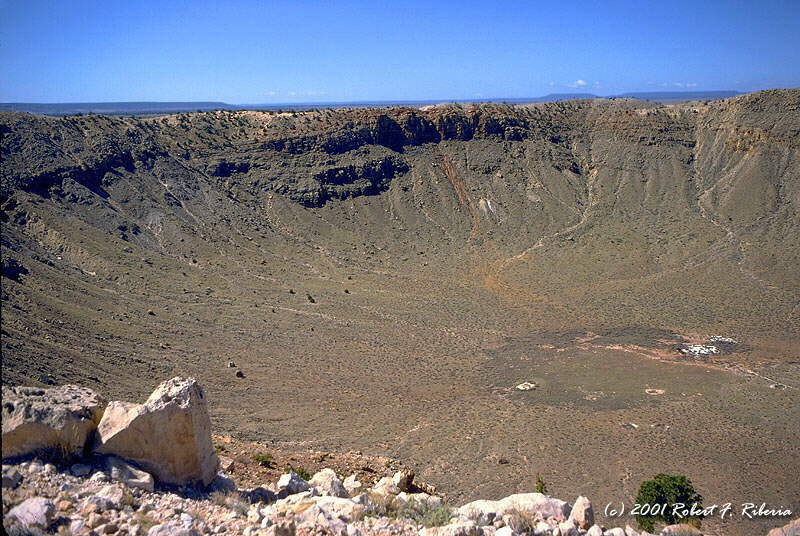 The crater was caused by a house sized meteor impacting about 50,000 years ago and the numbers are mind boggling. The iron-nickel meteorite was traveling at 40,000 - 50,000 mph when it impacted. The explosive force was greater than 20 million tons of TNT and the explosion generated intense shock waves in both the ground and in the atmosphere. Trees were leveled for miles around. Tons of rock experienced limited vaporization and extensive melting. In less than a few seconds a crater 700 feet deep and nearly a mile across was carved into the rocky plain. A 60 story building could sit within the crater and not extend over the rim. Over 175 million tons of debris were ejected from the crater. Most of the meteorite disintegrated during impact due to fragmentation, vaporization, and melting. It's an interesting fact of physics that even if a projectile impacts the ground at an extreme angle, it still results in a circular crater. Most of the fragments of the meteorite that were recovered were imbedded way up on the south wall of the crater. If you look carefully you can see streaks of red material running down the south side of the crater where core samples were dug to retrieve samples of the meteorite. Meteor Crater, and one of its residents, in northeastern Arizona. The crater looked absolutely huge from the rim. Even a wide angle lens couldn't capture it all in one picture. The remarkably smooth bowl of the crater was very impressive and I'd never come across anything quite so symmetrical in my travels. The fact that it was caused by an object from outer space seemed to increase the impact. 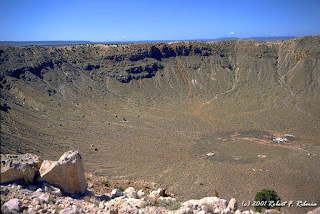 Although the crater was impressive from a scientific standpoint, it didn't do much for me artistically. However, my esthetic senses were once again ignited as we headed back into Utah. The weather had been remarkably clear for several days. Wide open, crystal clear blue skies were the norm after the storms of the initial days had subsided. 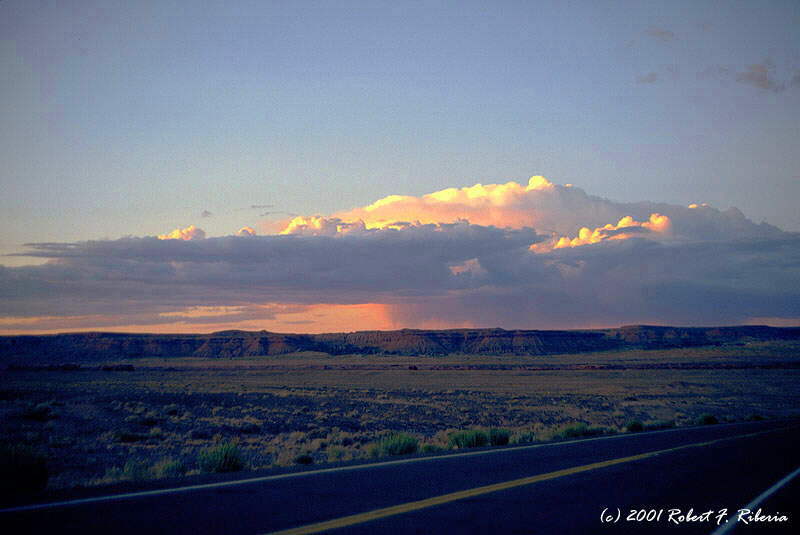 As we headed through northern Arizona we spotted a distant thunderstorm slowly moving across the horizon. The storm system was completely visible - from the top of the thunderhead to the ground underneath, which was being impacted by lightning bolts. While this type of phenomenon is common in the southwestern deserts, it was unlike anything I had ever seen back east. When it rained in New York it just got hazy and started to rain. I couldn't remember ever being able to see 50-100 transparent miles away (i.e. no haze or smog) to see an approaching storm. 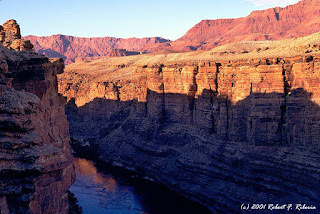 The Goosenecks of the San Juan River - I made it! Finally, on July 10, 1986, I visited the exact spot that was on the postcard that started this whole journey - The Goosenecks of the San Juan River. We passed through Monument Valley on the way, which was very impressive. However, the satisfaction of reaching a goal made the Goosenecks even more impressive for me. I felt as if I had come home. Little did I know...I actually had. After setting up camp atop a mesa not too far from the Goosenecks, I went on a solitary hike about an hour before sunset. The silence that surrounded me was deafening. The only sound to occasionally break this profound silence was that of tiny lizards scurrying about as I walked atop the mesa. The captivating smell of Junipers and Pinion Pines permeated the air. Mammoth house-sized boulders covered with beautiful streaks of desert varnish and multicolored lichen teetered on the edge of the mesa. As I explored the mesa top I thought about how very special the life forms were that were all around me. I found them special because life has to struggle so much harder to survive out there. 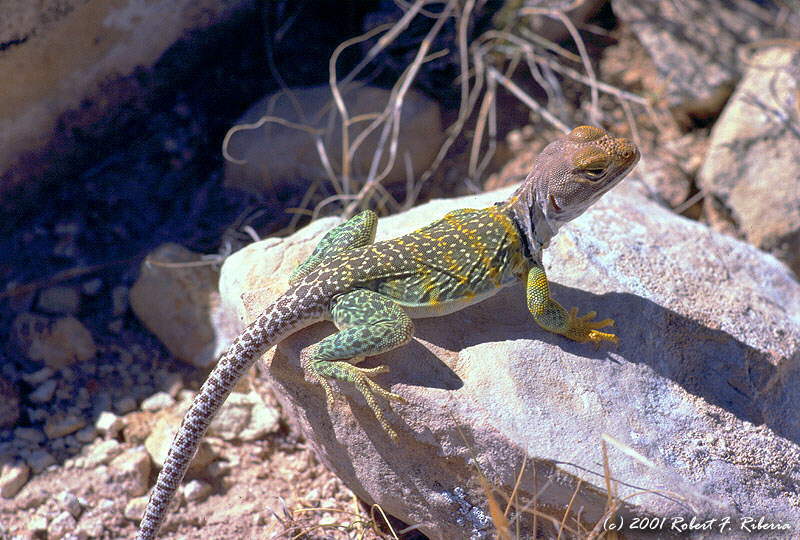 The simple act of living is somehow intensified for the plants and animals of the high desert. I made my way over to the edge of the mesa and sat on the edge. I looked out upon the bizarre, unimaginable landscape that lie before me, and there wasn't even the slightest sound or hint of movement. As the Sun got lower the sky seemed to ignite with an exquisite shade of red. A small bird flew overhead and I heard its wings cutting through the air. I looked out upon the land, upon all of that twisted and contorted rock, and pondered the great forces that created it all. It was very clear that there are powers in this land far beyond anything that mankind could ever imagine. The physical and spiritual manifestations of this power are undeniable when you are immersed within it. Here was a scientifically trained analytical person with a technical explanation for just about anything, confronted with one of the most profound mysteries of his entire life. My scientific training was telling me that there was nothing mystical about this land, yet there was no denying that I was experiencing something very mystical and very real. My entire world was turned upside down. I reflected back upon all the remarkable things that I had seen since entering southern Utah. 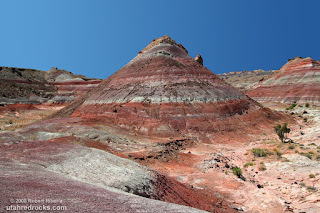 The immense and beautifully colored buttes, mesas, monoliths, and spires. The deep canyons, magnificent mountain ranges, vast open spaces and the unbelievable solitude. Then I then looked around and considered the lack of water, blistering temperatures, and the remoteness of my location and I realized that in spite of that I had no fear of this land. I had let go of all my fears. In spite of the stark desolation there is an intense feeling of immense peace and contentment there. It is an overwhelming feeling that not only comes from within, it seems to emanate from the land itself. It completely envelops you, penetrating your soul and never leaving it. From that day on, it has been a part of me. A day does not go by when I am not back there in spirit, drawing strength from it. I made my way back up to the campsite and began the rest of my life, which would never be the same. 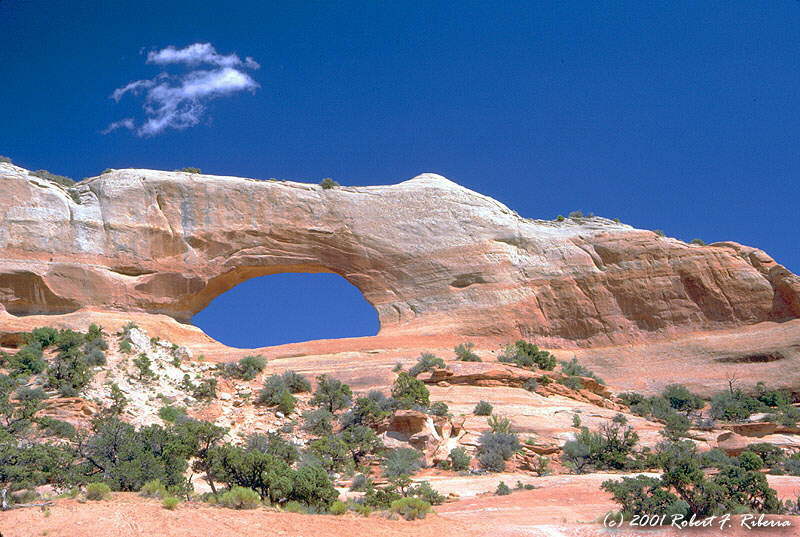 This beautiful arch is located right by the side of Highway 191!Where does one go after a life changing experience? Well...to Moab of course! Actually, on the next day Dave and I did a bit of exploration in the Needles District of Canyonlands National Park but our wild week of exploration was beginning to take its toll. We were quite tired, and a bit worn out. An infestation of red ants at our Needles campground made us decide to pack up and spend our last night in Utah up in Moab. It was a wise choice because we had nearly 500 miles of driving to get in the next day. We slept well! If I had it all to do over again there are very few things that I would change. Given that we only had 8 days to take all of this in, I probably would cut out the Arizona portion of this trip. Although Arizona has a lot to offer, the canyons of southern Utah are unmatched for their red rock beauty. I still feel that the views from the Island in the Sky District of Canyonlands National Park and Dead Horse Point State Park exceed those of the Grand Canyon, primarily for the variety and intensity of color. Eight days in southern Utah is barely enough time to get a taste of what it has to offer, however, it is more than enough time to change the course of a person's life forever. Twelve years after my first trip into Southern Utah, I finally came home. I love it here. It's kind of a long story, but our cat Steve was involved with the Phoenix mission to Mars, and actually has a rock named after him on the red planet! Click his picture to visit his website.